We’re fast approaching the two year anniversary of Excavated Shellac – having explored, so far, over 100 78s from about 70 different regions and cultures. I thought I’d take this week to go back to Portugal – in fact, to the same artist I posted a fado by in April of 2007 – the unsung Maria Alice. 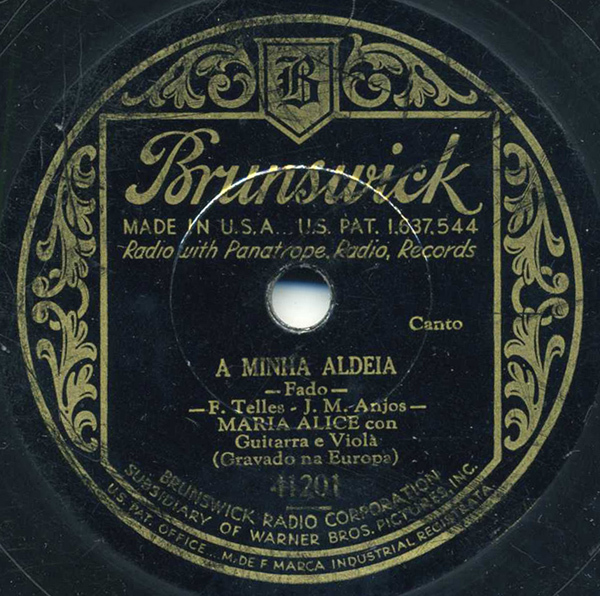 Maria Alice was born in 1904, and was singing the real fado by the late 1920s, recording for the German Polydor label. This piece, with unknown players on the guitarra and violão, was recorded in about 1930 in Lisbon. The title translates to “My Village.” Far more eloquent words about fado’s saudade, “a quintessentially Lusitanian melancholy mixed with nostalgia and yearning,”* have been written elsewhere, and I could not do them justice – suffice it to say it is an essential part of this song, and all great fados. Ms Alice died in 1997. How this ended up being released by the Brunswick label in the United States is interesting for ephemera-seekers like me. By 1929, the American label Brunswick, a very popular label throughout the early part of the 20th century, was in dire straits due to the Depression and other problems. British Brunswick, their counterpart, had collapsed. To stay alive, in 1930, the American Brunswick label was sold to Warner Brothers, but despite Warners signing up stars left and right, the records did not sell, and in late 1931, Warners sold Brunswick and its contracted artists to the American Record Corporation. It appears, however, that during its brief period of owning Brunswick between 1930 and 1931, Warners continued a relationship which began in 1926 between Brunswick and Deutsche-Grammophon, and reissued classical and some “ethnic” records from German D.G labels in the United States. They don’t turn up much, but I believe the sound quality of the German recordings are quite nice. This is one of them. *Peter Manuel, Popular Musics of the Non-Western World. This is a lovely piece (a little too fast, perhaps?). And there’s so much good music here! Thanks for taking the trouble. Too fast in terms of record speed, or too fast in terms of the song itself? There’s definitely no issue with record speed on this one, unlike the complex issues on the Congolese track posted a couple of weeks ago. Alas, it’s just a short song. I can infot you that has been published in the portuguese label FAROL one CD with the first 20 tracks recorded by Maria Alice. The sound is fantastic and you can order the record from http://www.tradisom.com.